On January 5th, MLS announced its Generation Adidas class for 2018. The six players named to this January’s class will all be eligible for selection at the MLS SuperDraft on January 19th. 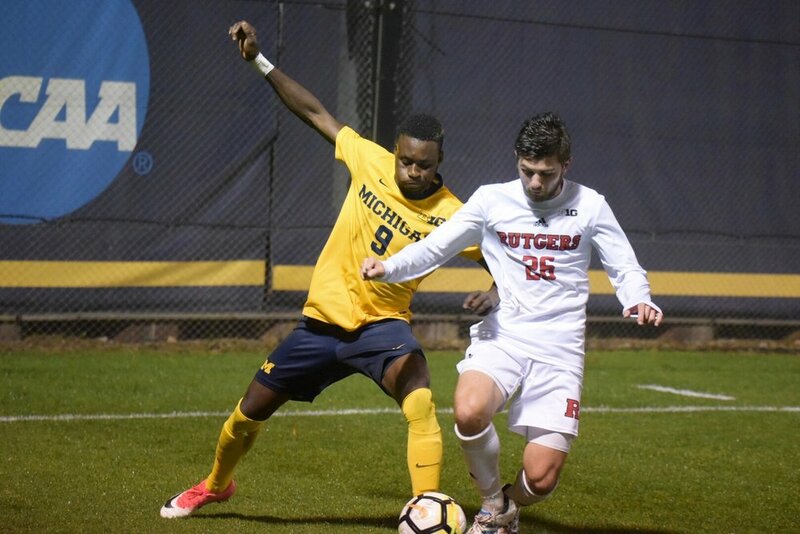 Atuahene’s professional eligibility has been a topic looming over the Michigan Soccer program each off-season following his break-out Freshman campaign. A season that saw him awarded as a First Team All Big Ten selections, as well as the conference’s Freshman of the Year. Many thought he would be ready to take his game to the next level in 2015, but the loyal Wolverine completed 2 more seasons which allowed him to lead the Wolverines to their first ever Big Ten Conference Championship this past fall. Though many viewed Francis as a professional prospect in 2015, all eyes were on this forward after his stint with the Michigan Bucks of the PDL in the summer of 2017. After an amazing season with the PDL side, including a stellar US Open Cup Goal against Saint Louis FC, He was featured as high as #1 in the very credible Top PDL Prospects list. Michigan Bucks teammate Ema Twumasi of Wake Forest also joins Francis in this Generation Adidas class. 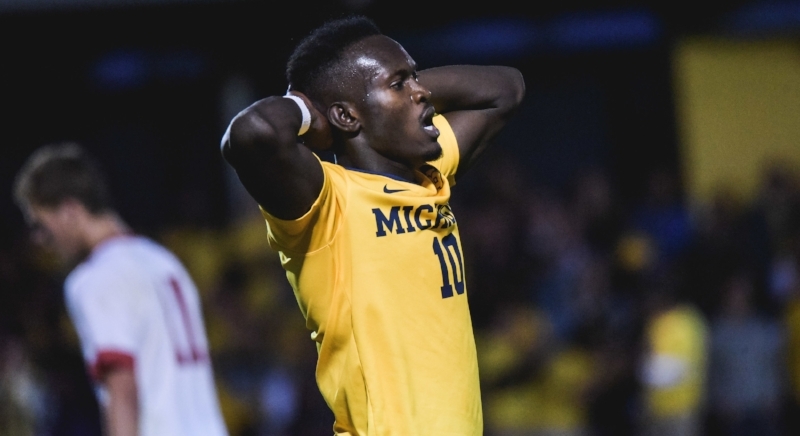 Atuahene leaves Ann Arbor as one of the most decorated Wolverines in the program's history, and will immediately turn his attention to the MLS Combine set for January 11-17 in Orlando, FL. Things move fast as the MLS Superdraft will be hosted on January 19th in Philadelphia. According to a piece by SBI Nation, Francis could be in the mix to be the first player selected in the draft should he check all the boxes at the combine. Francis himself added, "I plan on participating fully at the combine. I now have Generation Adidas as well as myself to represent, and as a player declaring late I have a lot to prove to MLS Teams and Scouts in Orlando." MSN: Can you shed light on your experience with Right to Dream Academy and how they have helped you along the way? FA: To Right to Dream I owe everything. They came right into my village when I was 10, brought me to the academy, which then brought me to the states. The have constantly been checking on me and watching me progress. I have been able to stay in contact with my former classmates who are continuing their careers as well. I am very happy to be an ambassador for the program and help those coming up. I just feel privileged and to be apart of such an amazing organization. MSN: Any thoughts on your time spent with Michigan Bucks in PDL, do you believe your play there helped your draft stock? FA: The Bucks helped me a lot. Once soccer is over in college, you don’t get enough touches. Michigan Bucks gave me an opportunity to keep things going and play against some of the best players in the nation. I am always hoping to be the best player I can be, so playing against the best talent was a great option for me facing USL and PDL opponents. MSN: Did winning the big ten regular season championship, achieving one of your goals, make it an easier decision to take the next step? FA: For me, I have always tried to plan ahead with my coaches and family. I told them that if I have a good season and I can leave the program where I want it to be, I may consider professional options. Unfortunately I was injured a lot of the season, but then in conference I was still able to help and thankfully our team was able to play great soccer without me. When the Generation Adidas option came, I decided to pursue it knowing that the University of Michigan was in a better place than when I arrived. I took it personally in our season before in 2016, so having a bounce back season it felt like I needed to treat it like a senior year as my teammates looked up to me. I always have wanted to lead by example and create something special and thanks to our amazing team and coaches we were able to have a memorable season. MSN: Where are you currently in regards to classes here at Michigan? Will you be finishing out the semester? FA: I withdrew from classes on January 2nd to take a few days in my decision. After choosing to go pro and announcing last Friday, my schedule over the next couple of months is booked, therefor I will be leaving campus this Thursday. I will miss the University of Michigan a lot, and look forward to visiting soon and perhaps continuing my education down the road. MSN: Any final words for the Michigan Soccer fan base? FA: I want to thank my teammates and coaching staff first of all. Each coach on that staff played a role in my life and career. Coach Chaka and Tommy have been great friends and role models my entire Michigan career. When recovering from injury I could not have gotten through it without this program, staff and teammates. Even last year I have to thank this fanbase for sticking through us in a harder season and I am happy we were able to present them with the Big Ten Championship this year. These are friendships that will last forever, this is Michigan. MSN: Any words for younger players currently at Michigan or the incoming recruits? FA: The key for me is to trust the process and this staff and more importantly to trust your own ability. There is a role for each player in the program, and the quicker that we learn our roles the better our team can play. I trusted these coaches the moment I got here, and because of them I was in position to showcase my talents. It may not always be fun and games, but if you trust this program, everything will work out for the current players at Michigan. Derick will join this club as a local product of Novi, Michigan. As he can be used in various attacking roles, he elevated his stock as a goal scoring #9 for his youth side, Crew SC Academy Wolves. View Derick Broche highlights here. Declan has featured mainly as a left back for his home club Pateadores Academy in Southern California. The left back spot seems to be currently owned by veteran Marcello Borges, but true left backs are rare. We will keep an eye on the possibility of Declan's arriving providing more opportunities for Borges to play different positions of need for the Wolverines. View Declan Gaffney Highlights here. Aidan joins the program right from our back yard in Saline, MI. Aidan made his commitment in 2016 and comes from a family of Wolverine graduates. Aidan has manned the central midfield for Crew SC Academy Wolves over the past 3 years and will be a great technical addition to the Michigan roster. View Aidan Nam Highlights here. Kevin is another local midfielder from Rochester, MI. He has featured in the center of the pitch for more than 4 years at Vardar Academy and can also be seen at an outside back. View Kevin Buca highlights here. Sosa joins Coach Daley as a fellow Canadian from London, Ontario. Sosa also plays his club ball with Vardar Academy and came on late as a high profile recruit. As he is capable of knocking the ball around in the midfield, we expect him to make the transition to forward giving the wolverines even more attacking options. View Sosa Emovon highlights here. As we are sure the talent and quality of these players check out, we are most impressed with the local flavor of this class. In recent years, you have seen the state of Michigan's top recruits end up at the likes of MSU, Oakland and most notably leaving the state altogether. With Wolves teammates, Derick and Aidan joining forces with Vardar teammates Kevin and Sosa, Michigan has once again made it's case as one of the elite collegiate soccer options in the state. There is still time to add to this class with late commitments and transfers, but these players look poised to continue the raised level of play in Ann Arbor. Michigan, Jack Hallahan, wasted no time in this NCAA tournament matchup as the sophomore forward buried two goals in the opening 9 minutes. The wolverines pressed the Colgate back line on and off the ball in the opening minutes of this contest and the visiting side looked as though the pressure would be too much. The Michigan showcase became a two sided game in the 16th minute when an initial save by Henry Mashburn was not enough. A Colgate chance first saved by Mashburn, was poked in the back of the net (2-1). The Colgate goal gave the Raiders much needed confidence they were lacking, but it was Michigan who seemed most affected by the score. Following the Raiders’ goal, Michigan sat in deeper looking to hold on and close the half up 1 goal, but with 28+ minutes remaining the Colgate resurgence was too much. Uyiosa Omorogbe found the back of the net in the 40th minute after tucking home a Colgate cross served from the left wing. Sides entered halftime tied 2-2. The second half was a slugfest. Michigan came out in the first 15 minutes of the second period in the shape of a refocused side poised to find the go ahead goal. Though a majority of possession lead to chances in the final third, Colgate held strong defensively and sent away all dangerous opportunities. After weathering the initial Wolverine storm, the Raiders turned up the heat in their own pursuit. The halftime talk for the Raiders was obvious: survive the first part of the second half, then go for this thing. The underdogs in Colgate, as many would say, had nothing to lose. And did they ever play like it. Collegiate overtime rules give teams like Colgate an incentive to go for a result in the first 90 minutes of play. Colgate was unwilling to leave their fate to an overtime chance, and sent numbers forward for the remaining minutes of the match. To be fair to Michigan, they didn’t shell in the the latter minutes either. This Wolverine side, that only used 13 players in this match, fought and clawed for their own chances down the stretch. A late Michigan chance turned into a counter attack for Colgate. Playmaker Jared Stroud stepped up to take a earned Raiders corner, curled in a service from the left flank that met the head of Aram Ouligian. Ouligian’s chance stunned UMSS as he climbed the Michigan defender in front of him and bashed the service into the goal giving Colgate the 3-2 lead with just five minutes remaining. The Wolverines quickly grabbed the ball and brought it forward in search for an equalizer. Late services in the box were properly defended by Colgate, and the visiting side was able to close out the come from behind stunner here in Ann Arbor. We won’t call this result a collapse. Interesting tactical decisions for Michigan included minutes with Jackson Ragen sitting in front and sometimes within the Michigan backline (Abdou Samake on the bench). The most interesting, difficult, change to overcome came in the 61st minute when Robbie Mertz came out for a breather. He did not return until the 79th minute and it was in that stretch that Colgate looked the most dangerous. We are not to question the stamina of Mertz, or the decision by Daley. In a game that featured a slimmer bench, you look for the leaders to remain on the field, and Colgate saw the Mertz sub as a chance to send more bodies ahead. It’s worth noting that this Colgate is appearing in its second consecutive NCAA tournament. After winning the Patriot League tournament, this Michigan win marks six wins in a row for this side that has to be one of the hottest teams in the entire nation. With their experience and current form, they will be a serious player in their 3rd round matchup at Louisville on Sunday. Special thanks must go out to seniors Tristan Jacob, Grant Mattia and iron man Billy Stevens. What an unbelievable season these seniors lead us through. Tristan Jacob played some crucial minutes early on that helped build this NCAA resume, and Billy Stevens was a constant as always for this group. They leave this program in perhaps the best shape it's been in since becoming a varsity sport. This side will return 10 starters, should all those that are eligible return. This roster will be viewed as perhaps the most talented in the Big Ten and a factor nationally from the jump in 2018. MSN is fortunate to have covered such an fun side. Thanks again to Billy, Tristan and Grant. We look forward to following this Michigan Soccer Program in the future. 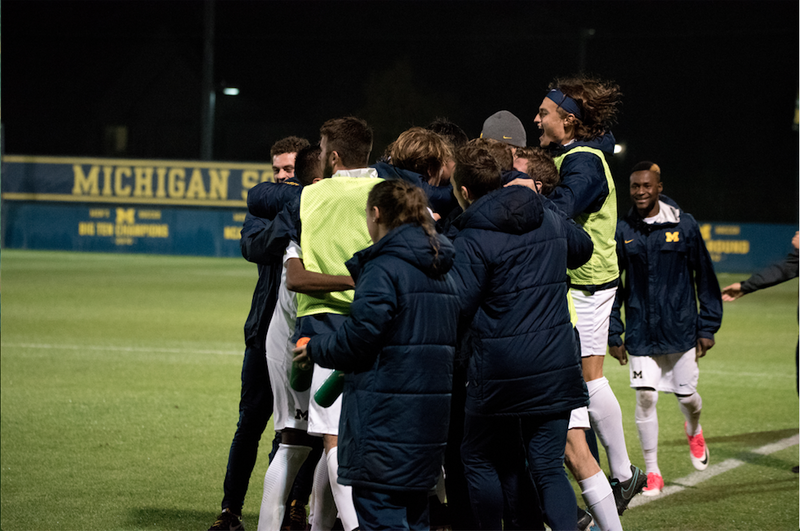 The Michigan Wolverines found out their NCAA fate Monday, November 13th in what became a historic day for this Men’s Soccer program. Coach Chaka Daley’s side earned a 13th overall seed, which gives them a round 1 bye. They now await the winner of Colgate and UMass. The news has to come as a moral boost as the Wolverines are fresh off a disappointing result against the Wisconsin Badgers in the Big Ten Semi-Final. Those same Badgers went on to win the Big Ten Tournament outright, making the November 10th loss not so damaging. The selection committee showed their respect for Michigan with a valuable 13 seed. Looking back at our season preview, we noted that this fall’s schedule was slated very nicely for this group. Though Michigan didn’t play host to many marquee nonconference opponents, they did host 7 non Big Ten games for a 5-1-1 record. Two narrow nonconference road loses (Western Michigan, Notre Dame) did not damage Michigan’s resume either as both of those sides also earned first round byes in the College Cup. Seven of Michigan’s seventeen regular season opponents earned a NCAA bid, giving the wolverines one of the strongest strengths of schedule in the entire nation. UMass will host Colgate on Thursday, November 16th. The winner will then immediately travel to Ann Arbor as Michigan will host its second round game on Sunday, November 19th at 5pm. The winner will advance to the College Cup’s Sweet 16. Should Michigan win its match on Sunday, experts would predict the Wolverines to travel to Louisville for round 3. The Louisville Cardinals await the winner of Cal vs San Francisco. If one of those west coast sides were able to upset the Cardinals, Michigan would be in play to host a 3rd round match. With one of the Big Ten’s youngest rosters, Coach Daley has to be excited and more-so relieved with his team’s NCAA draw. They can eliminate the taste of a Wisconsin loss with a win this Sunday. This Michigan team has the talent to do so. As we understand the college overtime rules, there must be a winner in this tournament match. Look for the Wolverines to apply pressure early as the home favorite in search for a goal. It would be foolish for this Michigan team to sit in with superior talent as unpredictable penalty kicks would loom. Standouts Francis Atuahene and Jack Hallahan can turn a game upside down on their own, but eyes should should be on the depended on youngsters Ybarra, Zakyi and Osman as these freshman will be looked to by their teammates in this elimination game. MSN will have a match preview once Michigan’s November 19th opponent is finalized. Tickets for Sunday’s 5pm home NCAA match can be found here. Michigan’s Big Ten Tournament started off with a bang as the Wolverines walked past Northwestern, winning 4-1 Sunday. It was a physical battle, and the Wolverines looked dominant for much of the match, though Northwestern gave them a run for their money early in the second half. Francis Atuahene started the party for the hosts, scoring in the 24th minute following a good period of play. A long throw in from the right wing bounced past everyone in the box and fell kindly to Atuahene at the back post. He made no mistake and buried the ball safely in the back of the net to make it 1-0 for U of M.
Michigan were dominant in the first half, but didn’t create many other clear cut chances, and held a 1-0 lead at halftime. The halftime team talk must have riled the Northwestern men up, as they stormed out in the second half. Just 5 minutes in, it was Northwestern’s Tommy Katsiyiannis who capitalized on a loose ball to equalize for the visitors. Shell shocked, Michigan realized there was work left to be done. 6 minutes after Northwestern scored, Hallahan picked up the ball on the 30 yards from goal, took a look at the keeper, and picked his spot. He curled the ball to the far post, and watched as it nestled in the top corner to restore the advantage for the Wolverines. It was a truly well taken goal. Clearly in control now, Captain Robbie Mertz decided it was his turn. Following an incredibly precise 55-yard pass from left back Marcello Borges, Robbie cushioned the ball with the outside of his boot, settled himself, and slotted the ball past Northwestern’s keeper to double the lead, 3-1. The scoring didn’t stop there. In the 77th minute, Jack Hallahan added his 2nd and Michigan’s 4th, goal of the evening. He collected the ball on the right wing before running at his defender and curling a low drive into the bottom corner. Northwestern pressed until the final whistle, but the match had been over for some time. Michigan defeated Northwestern, 4-1. This was the performance we were hoping for. Keeping in mind our last match against Northwestern (a 3-1 victory that wasn’t decided until late on), it was nice to see Michigan get the job done at home. This is a matchup that Michigan should win 10 times out of 10, with all due respect to Northwestern. When you consider the talent in the Michigan side this season, there really shouldn’t be any contest between these two sides. Thankfully, Michigan took care of business. That said, the goal Northwestern scored was troubling. Michigan allowed a lesser opponent to bundle home a sloppy equalizer at their stadium. Against stronger opposition, this easily could have been a fatal mistake. A better side may have punished the Wolverines then and there. Michigan, however, had other ideas about all that. They regained control of the match and were clinical when they needed to be. With 5 days before their next match, Michigan will be feeling confident that they can handle whatever their opponents may throw at them. Michigan will face #5 Wisconsin (who they defeated during the regular season 2-1) in the Big Ten Tournament Semifinals, Friday November 10th @ 12:00 pm. Big Ten Conference Champions Michigan will host either Northwestern or Rutgers at UMSS on Sunday November 5th in the Quarterfinals of the Big Ten Tournament. Following Michigan's first ever regular season Conference Championship win last weekend (see Take-Aways for more on that result), the Wolverines jumped 7 places in the NCAA Rankings, and are now the 12th ranked team in the nation. With a number 1 seed, and a favorable match-up at home, we fully expect Michigan to advance to the Semifinals. That's not to say that Northwestern and Rutgers are incapable of causing the Wolverines problems Sunday, though. Northwestern (1-7-0) and Rutgers (0-8-0) both lost 3-1 against Michigan earlier this season. However, both teams were able to make things challenging for the hosts on their respective trips to Ann Arbor. Northwestern went up a man early on and, despite the loss, kept things close until the final minutes of the match when Jack Hallahan struck on the counter attack. Rutgers similarly conceded a goal late on in their match to make the scoreline look more comfortable than it truly was. Both teams have shown they are capable of scoring at UMSS. The question is: Can they do so on Sunday? The schedule will favor Michigan, who will have had a full week to prepare for this one. Rutgers and Northwestern, on the other hand, will face each other on Saturday, November 4th, before waking up the next day to take on the Big Ten Champs. The tired legs alone should tilt this tie in favor of Michigan. We expect a cagey, physical match, with the visitors looking to sit deep and stay compact - regardless of opponent. With the expected inclement weather also sure to play a factor on Sunday, things may not go exactly according to plan. Still, With Big Ten Coach of the Year Chaka Daley at the helm and a solid core of starting players, we expect Michigan to handle whoever they play with relative comfort. Our prediction: Michigan defeat the winner of Northwester/Rutgers, 2-0. Tickets or that match can be found here. Finally, From all of us here at MSN, we want to offer our sincerest congratulations to ALL the U of M players honored by the Big Ten this week. Michigan hosted the University of Detroit Mercy Titans to UMSS on a chilly Wednesday night. Despite being the favorites in this match, U of M looked disconnected from the beginning. The team began the match with a strong, but slightly modified starting 11 - Henry Mashburn remained in goal following his performance against Ohio State. Meanwhile, Tristan Jacob began in place of Marc Ybarra in midfield, and Umar Farouk Osman started the match on the left. Detroit sat very deep defensively, remained compact and worked hard to make things difficult for the Maize and Blue on Senior Night. The visitors game plan worked quite well. Michigan were able to create 4 goal scoring opportunities in the first half but none caused any real trouble for Josh Flamme in the Detroit goal. Michigan surely weren't thrilled to be going in to the break level at 0-0. The second half started better for the Wolverines - the introductions of Marc Ybarra and Jack Hallahan helping for the hosts. In the 74th minute, and with Michigan dominating the match, a long throw in was flicked on by Marc Ybarra. It fell kindly for Marcello Borges, who smashed his effort on target. Flamme made a strong save, but was unable to clear the ball away, and Francis Atuahene slammed the ball into the back of the net to make it 1-0. It was a deserved breakthrough, as Michigan had been dominating for large portions of the second half. With just over 15 minutes remaining, the home side sat back, allowed the Titans to come forward, and looked to kill the game off. Detroit wouldn't give up, and forced Michigan into some tough situations, but in the end, it wasn't enough. Michigan closed out a difficult, but well earned 1-0 victory at home. This is the kind of game that Michigan needed to win. With all due respect to Detroit, there shouldn't be any contest between these two sides. Michigan are ranked 19th in the NCAA poll, while Detroit sit in 111th. That said, the hallmark of a great team is winning when you don't play well, and that's exactly what Michigan did. The first half was poor. It seemed like a 'hit and hope' approach for the home side, and their play looked disjointed. There was no connection between the defense and midfield, no connection between midfield and attack, and no connection in the final third. Every good opportunity seemed to be squandered away. The Wolverines didn't look on. Then the second half kicked off and a bit of normalcy returned. Marc Ybarra made a big difference in possession - his presence in the middle of the field settled things down and allowed for Ivo Cerda and Robbie Mertz to push higher up the pitch. Jack Hallahan added pace and width down the right, and helped to spread the game. In the end it was a set piece that made the difference. Borges did well to force a save and Atuahene secured the result with a poachers finish. Still, we got a very uneasy feeling watching this match. Michigan travel to Maryland on Sunday to take on the 12th ranked team in the nation. Surely Coach Chaka Daley will be disappointed at the amount he had to use some of his players on Wednesday, who will play their 3rd match in 8 days on Sunday. A performance of this caliber on Sunday will undoubtedly see Michigan lose, which (as we predicted in Take Aways) may mean missing out on the National Tournament. Michigan will still host the Big Ten Quarterfinals on Sunday, Nov. 5th, but we're hoping the Wolverines put on a strong performance this weekend. If they don't it might mean their season ends a little bit earlier then they'd like. Before this match, we predicted Michigan would win easily by a 3-0 scoreline. We weren’t that far off. The Wolverines took control of this game from the first kick and never looked back. A Rutgers goal in the final ten minutes of the first half made things a little more interesting, but U of M never looked like letting this one slip through their fingers. The match burst to life in the 7th minute when Robbie Mertz’s offensive pressure paid off. He fed the ball through to Mohammed Zakyi, who picked out Ivo Cerda in the box with a perfect cross and Ivo tapped in to give Michigan a 1-0 lead. Straight from the kick off there could have been a second goal - Francis Atuahene’s pressure this time the difference. He dribbled to the top of the box before laying the ball off for Mertz, who saw his effort palmed to safety by the Rutgers keeper. It was clear that Rutgers were teetering, though, and in the 20th minute the game looked to be put out of reach for the visitors. Zakyi was again involved, this time linking up with Atuahene down the left. Francis slammed his low drive past the keeper and into the bottom right corner to double the lead. Michigan were cruising. Ten minutes before the break, Rutgers got one back. A long ball played to the back post found the head of Rutger’s Striker Ryan Peterson. No one picked up his run and he guided his header past an outstretched Andrew Verdi to keep Rutgers in the match. There was a slight momentum shift as Rutgers worked to capitalize again before the break, but never really came close and the sides went in level. In the second half it was clear that Coach Chaka Daley had calmed the nerves. Michigan were back in the ascendancy, dominating the possession and creating opportunities at every turn. With just 12 minutes gone in the second half Atuahene grabbed the third goal (and his second) of the match to finish Rutgers off. Thanks to a deflection that fell kindly for him, Francis found himself with just the keeper to beat inside the box. He confidently curled the ball around the keeper, and despite a slight touch on it, the ball still tucked itself in the back of the net. At 3-1, and with Michigan really clicking, the result never looked in doubt from then on. This was more a ‘must not lose’ situation than it was a ‘must win’ situation. This Rutgers team, with all due respect, is simply not as talented or capable as Michigan is, and a loss here could have really affected the men heading into the final 5 matches of the regular season. Thankfully, Michigan got the job done -in some style too! First, we have to recognize the Man of the Match, Mohammed Zakyi. We wanted #MoGoals, and we got #MoAssists. The Ghanaian tied a single match U of M record, set by Ann Arbor legend Knox Cameron back in 2003, with 3 assists. Mo was clearly the "straw that stirred the drink" in this match. Each attack started or ended with his excellent wing play, and alongside Francis Atuahene and Jack Hallahan, there’s not a defense in the nation that will want to face these three. Robbie Mertz also played a big role Friday evening. He controlled the middle of the park both when attacking and defending. He sent several moves on their way and stopped several counter attacks. Questions remain in defense for this U of M side. Michigan conceded a weak goal on Friday evening, and against a better side, that certainly could have been a fatal mistake. It seems the Wolverines have worked out most of their kinks, but at this point in the season, the Wolverines can’t afford to concede weak goals. The likes of Maryland will punish any team that isn’t on high alert for the full 90 minutes. Overall, we’re very happy with this performance. Mo and Francis were nightmares for the Scarlet Knights back line and despite the goal the visitors got, they never truly troubled Verdi in goal. At 4-1-1 in Big Ten Play, we believe that this Michigan team can cause problems for anyone in the country. The Big Ten is the strongest conference in the country and U of M are thriving in it. Expect a strong finish to the regular season from this side. The Wolverines return to UMSS following a successful trip to Pennsylvania (See our "Take-Aways" section for more on that result). At 3-1-1 in Big Ten play, Michigan find themselves sitting 3rd in what is surely the most difficult conference in Division 1 soccer. Despite the slip up against a beatable Oakland team just over a week ago, U of M will enter this weekend's match up full of confidence and raring to go. The 2-1 victory against Penn State will help the mood in Ann Arbor heading into Friday evening's clash against Rutgers. So too will the apparent return to form of Francis Atuahene. His total of 4 shots on target Sunday was a match high, and despite not hitting the back of the net, it certainly seems like the Ghanaian is back at full strength. Expect big things from Francis Friday against a Rutgers back line that has allowed 14 goals in just 5 Big Ten matches this season. One to watch - Jack Hallahan. The Ireland Under-19 International is back at his best following his show stopping performance this weekend. It was his assist on Mohammed Zakyi's 71st minute equalizer, before turning from provider to finisher, winning the match with just 35 seconds left in the second overtime period (it was some hit, too). Keep your eyes on number 11 flying down the right wing Friday night. Tactically speaking, we're still not certain how the Wolverines will line up against Rutgers - though facing a weaker back line should mean we'll see the boys in Maize and Blue come out and press the visitors early on. However, if U of M don't find an early goal, don't be surprised to see the tempo decrease. Coach Daley likes to slow the match down through possession, with Marc Ybarra and Robbie Mertz operating in Defensive and Attacking midfield positions respectively to try and unlock the opposition. The pair draw a lot of attention in the middle of the park, which opens up space for U of M's dangerous wingers to exploit. Our prediction - Michigan walk away from this one comfortable winners, 3-0. Tickets to this Friday's match can be found here. We, like most of you, are unable to travel to U of M's away games. Unfortunately this means our in-game and post-game coverage is limited. To counteract this, we have started a new section on this blog - "Take-Aways" - where we discuss the highs, lows and ramifications of all the Wolverines remaining away matches. Enjoy! Michigan slumped to a 2-1 home defeat on Wednesday night against Oakland University. Only their second loss of the season, the Wolverines need to regroup and pick up an important conference victory on the road Sunday afternoon. Penn State has two wins on the season to date, coming against Saint Francis and Detroit Mercy (two notably less talented sides). On paper, this is a winnable match. As demonstrated on Wednesday evening, it's the result that matters. If Michigan can focus in on this match and forget about the implications of its result, we feel it should be smooth sailing. That's not to say there aren't issues that need resolving first, though. The central defensive pairing has been altered due to injuries in recent fixtures. Jackson Ragen and Peter Brown have filled in nicely, but it was Marcello Borges' absence from the side due to a suspected knee problem that felt like the biggest factor in Wednesday's defeat. A supremely talented player, Marcello offers width, pace in the channels, and recovers extremely well to help shut down counter attacks. Oakland scored Wednesday night from two counter attacking situations. We aren't sure that we'll see Marcello return Sunday in Pennsylvania, but we are sure of one thing - if the Wolverines can't sort out the defensive situation quickly, it could be a long trip back to Ann Arbor. Peter Brown filled in at left back on Wednesday, and while he had a decent match, he simply isn't the same player as Marcello. Sure, Peter offered a lot both going forward and defensively. He isn't quite as pacey as Marcello, however, and we have to wonder how both goals may have been handled with that pace in the back line. Daniel Mukuna is still missing for the Maize and Blue as well. An imposing figure in the back line, Danny's absence was felt most when Oakland scored their first goal of the contest. An awkard 50-50 ball bounced kindly to head height for Oakland's Ricci, and he rose to meet it, guiding the ball past Verdi. Perhaps with Danny at the back that header isn't won by the Oakland striker - or at least, not as cleanly. The bottom line - we can speculate all we like about what could have been, but the fact remains that defensive solidity will win the Wolverines games this year. A misfiring and not fully fit Francis Atuahene isn't scoring the amount of goals we expected. U of M have found goals in other ways, but not consistently. When Michigan take the lead, they need to keep it. If the defensive errors are erased, we see no reason why U of M can't walk away as comfortable winners on Sunday. Michigan was hoping to pick up where they left off following a 3-1 victory over Northwestern this past weekend. Unfortunately, their momentum came to a grinding halt as Oakland struck twice in the second half to steal a 2-1 road win. Michigan dominated for the majority of the first half. In the 7th minute, after earning a free kick, Marc Ybarra gave the hosts the lead. His free kick bounced in the dangerous area but touched no one and sailed past the keeper to make it 1-0. Michigan’s dominance continued - Mohammed Zakyi came closest to adding another goal in the 21st minute. Jack Hallahan curled in a beautiful cross and Mo slammed his header toward goal. Oakland keeper Sullivan Lauderdale made a heroic stop to keep the effort out. Lauderdale kept the Golden Grizzlies within touching distance, making several terrific saves throughout. Michigan dictated the tempo for the rest of the half, but couldn’t beat Lauderdale again, and the sides went into the break with U of M leading 1-0. The second half started as bad as it could have for Michigan. Just 4 minutes in, Oakland’s Austin Ricci headed past Verdi to level the score, 1-1. Michigan seemed shocked. Less than 20 minutes later Oakland again took advantage on the counter attack, this time through Jacob Moore. He controlled the long ball well and slotted it past Verdi to give the visitors the lead. Despite Michigan having several good opportunities to get back in the match, Lauderdale continued to prove too much for the Wolverines front line. With time running out, Zakyi saw a headed effort saved yet again. Lauderdale and the Golden Grizzlies held on to secure a 2-1 victory. A tale of two halves – was there ever a better footballing cliché? Still – Michigan came out flat in the second half and it cost them. Unable to deal with two relatively manageable long balls over the top, the Wolverines conceded from both, and lost the match because of this. Possession was still in favor of U of M in the second half, but the sharpness disappeared. The passing was less crisp, the offense seemed to be disconnected and with no one to aim at, there was too much possession without purpose. Michigan’s full capabilities were on display in the first half, and their inexperience shined through in the second. With a difficult Big Ten road match at Penn State Sunday, we’re hoping the Wolverines learn (quickly) from this one and move on. The Wolverines came up with 3 goals at home despite missing several key figures through injury and Francis Atuahene being dismissed less than a minute after the hosts opened the scoring. Northwestern were surely hoping to stifle the Maize and Blue early on, but conceded in the 31st minute - Ivo Cerda scoring his second of the season. Just a minute after the restart, the Wildcats hopes were boosted when Francis was shown a straight red card for planting a boot into the thigh of a Northwestern player. Frankly, it was a deserved red card. Despite being down a man, Michigan held Northwestern at bay for the remainder of the half. In the second half it was center back Jackson Ragen, filling in for the injured Daniel Mukuna, that doubled the advantage for U of M. The freshman found space in the box and powered the ball past a hopeless Northwestern keeper to make it 2-0. Just 10 minutes later Northwestern pulled one back. Wildcat Striker Sean Lynch's low drive across goal went past Andrew Verdi and in at the far post to make it 2-1. The match remained close until the final minutes of play. With less than a minute remaining, a Northwestern corner (on which the keeper had come up for) broke down and Jack Hallahan took off running. He raced past the defender to win the ball and with an empty net it was an easy finish to put the game to bed, 3-1. This was an extremely important win for U of M. We said coming into this one that U of M would need to make a statement at home - and make a statement they did. Going down a man early on makes any match difficult, but the Wolverines coped well. It was a smartly managed victory. Taking advantage of set piece opportunities was the difference between the sides - The first goal coming from a Michigan corner, the second through Jack Hallahan scoring on the counter attack following a Northwestern corner. This win will be a boost in confidence for the side, especially for Jack Hallahan, who hasn't had the best run of form as of late. He got back on track with a goal and an assist. He's a highly skilled player and he showed that on Sunday. Jackson Ragen and Peter Brown also deserve a lot of credit here. Filling in for Daniel Mukuna and Abdou Samake is no easy task, especially when down a man. Both have shown their abilities in the past few games, and Jackson's first career goal on Sunday will mean he can expect to see minutes, even when Samake and Mukuna return. 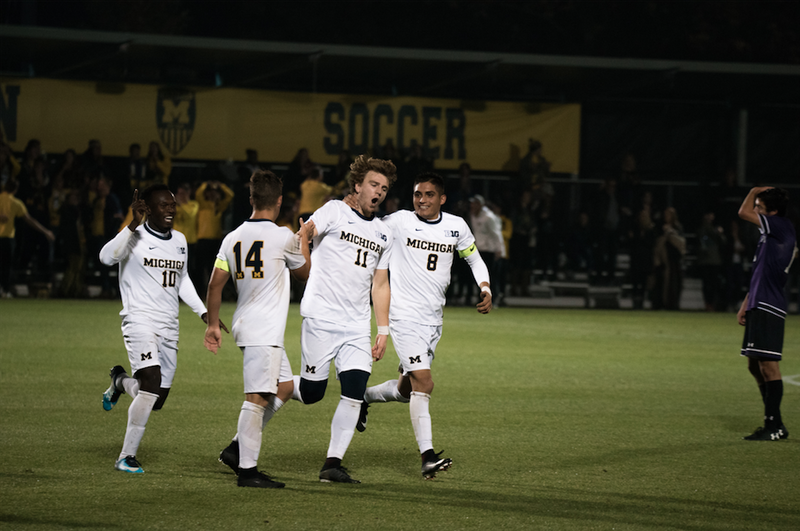 The Wolverines will be hoping to carry the momentum from this win into their mid-week non-conference match up against Oakland University, Wednesday at 7:30 pm at UMSS. Tickets to that match can be found here. Considering that Michigan’s loss Wednesday was to out-of-conference Western Michigan, the season still looks bright for the Wolverines. A narrow loss to State hurts their hopes of a conference title, and a slip up at Western could damage a national bid. Still, the Michigan resume looks pretty strong. The Spartans have been seen at #1 in some polls this week and Western Michigan may be the nation’s most underrated team. Conceding just 1 goal in each match, it’s safe to say that defeating this Michigan team will not be an easy task for anyone left on their schedule. Questions remain for this side, however, in their experience. Are these players mature enough to overturn their recent form and find a result against Northwestern on Sunday? We know that the leaders - Robbie Mertz, Marcello Borges, Billy Stevens and Ivo Cerda - can get this group back on track. The depth in the roster at the moment also raises some questions. Francis Atuahene wasn’t involved at Western on Wednesday. 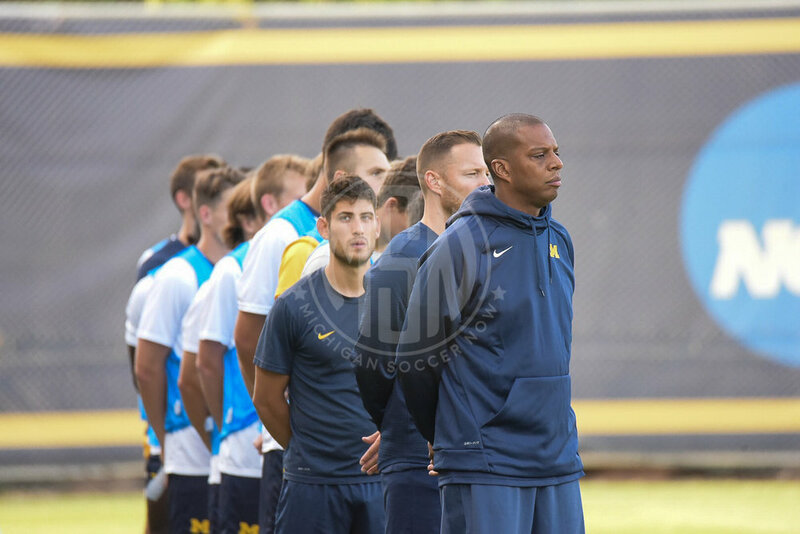 The Wolverines were also without both starting center backs Daniel Mukuna and Abdou Samake. Their replacements, Peter Brown and Jackson Ragen (who were both viewed as potential starters entering the season) held their own against WMU and are viable options this Sunday. However, they still lack the brute force and decision making that make the Mukuna-Samake pairing so imposing. The answer for the men this weekend is simple – they must score goals. Players like Jack Hallahan and Mohammed Zakyi can help strengthen the national bid by finding their form in the second half of this season. Despite recent results, this is capable offensive side that are due for a couple on Sunday. Could it be a Tristan Jacob set-piece that unlocks their potential? Or a bit of #MertzMagic? Whatever the case may be, Michigan need to play to their strengths and find a way to hit the back of the net. Although Michigan’s depth may be lacking through injuries to several key figures, we’ll be looking for Coach Daley's men to apply pressure early on against the Wildcats. This group plays with a completely different energy when they find a first half goal. An early goal at home vs Wisconsin had Michigan looking like a guaranteed Sweet 16 group. We hope the Wolverines recapture their swagger in front of the home fans this weekend. Michigan hosts Northwestern at UMSS this Sunday at noon. Tickets to Sunday’s Match can be found here. In front of a sellout crowd of more than 2,600 fans, Sunday’s Big Bear matchup was nothing short of a heartbreaker. Just as the game seemed destined for a breakthrough, Captain Billy Stevens was (unfortunately, and probably incorrectly) sent off. Left with 10-men and just 20 minutes to go, the game naturally shifted and State were once again in the ascendancy. Michigan, however, refused to crumble. The introduction of Jackson Reagan at the back in place of Jack Hallahan brought more solidity and the Wolverines held firm to force overtime. What could have been a confidence building draw was washed away in the final minute of the match when East Lansing’s very own DeJuan Jones stepped up and buried Michigan State’s final chance, Spartans win 0-1. It is important to note that both Francis Atuahene and Mohammed Zakyi started on the bench once again for the Wolverines. Their impact was felt as reserves as they both played extended minutes. The question is, and more importantly for Francis, is he still not fit to start? As a returning All Big-Ten player you have to wonder if even at 75%, Francis should be playing the opening minutes of the remaining matches. Michigan played it's second top-ten ranked program in a span of 5 days. The Wolverines forced overtime in both meetings. Despite Michigan looking flat for long stretches on Wednesday and again on Sunday, these were two winnable encounters. The fact that we're saying this about matches against two Big Ten (and national) powerhouses shows just how far this team has come since last season. Two things stand out. First, both results this week prove that this U of M side is a real contender in both the Big Ten and on the national stage. Indiana was the number 1 ranked team in the nation on Wednesday,(while MSU was ranked number 6), and earning an away draw in Bloomington will mean a lot to this young Wolverines side. Second, the loss to MSU will be a turning point for Chaka Daley's side moving forward. Losing hurts, especially when it's your first of the year. Especially when it's at home. Especially when it's against your arch rival. Especially when it's in the final minute of overtime. With far more talent than experience, the younger players will learn from this moment. The coming matches should see the aggressiveness increase. Michigan travels to Kalamazoo Wednesday to face a red hot Western Michigan side. The Wolverines are still without a marquee road win and a prime opportunity has been provided in their next match. With the Maryland match looming late in the season, U of M will no doubt be looking to gain as much momentum as possible heading into the second half of the season. The Michigan Wolverines opened up Big Ten play on a cool Friday night in front of one of the biggest Michigan Soccer crowds we can remember. A completely full Michigan Ultras section played witness to a very fast paced start here at UMSS. As both teams showed dangerous flashes early, it was Michigan who struck first. A fabulous build up out on the left flank resulted in a through ball played to Robbie Mertz. From there it was magic. Robbie took on his defender with an inside outside move, followed by a cruyff back on to his left foot where he then fired off a cross that met the head of Ivo Cerda. The Chilean was able to convert and gave the Wolverines the 1-0 lead in the 7th minute. The goal could not have been a more promising start for this club when considering Francis Atuahene was dressed but started the match, once again, on the bench. It was Cerda who was given his second consecutive appearance at the forward spot. Following the goal, Michigan opted to sit in more to absorb some of the oncoming Wisconsin attack. The threat of the Badgers was known as umich was seen making various tackles in their own defensive 3rd. Daniel Mukuna was given a yellow card for his defensive efforts on the Wisconsin playmaker, Chris Mueller. That said, Michigan was up to the task. Things changed tactically when Francis Atuahene entered the game as a sub replacing Umar Farouk Osman. Michigan turned up the pressure and things started to click for the club wearing Maize. After earning a corner in the 37th minute, the service was taken by Tristan Jacob. After a scrum in the box, the ball found the feet of Abdou Samake. Abdou wrestled off Wisconsin defenders and, some how some way, poked the ball over to Marc Ybarra who blasted the ball home in the 38th minute. The freshman’s first career goal put the Wolverines up 2-0. Michigan stood tall and battled their way to close out the half with their lead remaining at 2. The home team came out in the second half in a lineup that included Atuahene. The half time talk was clear for Michigan, keep the pressure on. The Wolverines fired 2 shots on goal in the opening 10 minutes of the second half. Wisconsin goalkeeper, Phillipp Schilling deserves credit for multiple saves that kept his side alive. After weathering the Michigan attack, Wisconsin was able to apply some pressure of their own. Andrew Verdi came up with a massive save in the 73rd minute that stopped a clear Badger breakaway. Wisconsin did find their break through late in the 85th minute poking one in past the Michigan Goalkeeper. With 5 minutes left the Badgers pressed as hard as they could for the equalizer, but they would come up short (2-1). Credit once again has to be given to this Michigan back line. These men, in addition to Peter Brown coming on as a sub, were able to give this club its most important defensive performance of the young 2017 season. Michigan flexed their muscles in this contest, got the win, and sent Wisconsin on their way. We have been waiting for Robbie Mertz, and he gave us magic in the 7th minute. His assist on the goal to Cerda reminded us of the past where he saw time out wide. We still trust him as a central midfielder, but boy is he dangerous in those flanks. Let us be clear, though the score may not suggest it, Wisconsin looked very dangerous in this match. Our MVP was Marc Ybarra. He was able to track back and aid his teammates, coming up with big time tackles all game. Not to mention, earning his first career goal for Michigan. The pulse of this group just changes when Francis steps on the field. We have to credit Coach Daley in his tactics as Atuahene on as a sub. At full strength, Francis will be a starter, but he has changed these games as a reserve of late. Finally, this team is for real. 5 games in, even though all of them have been at home, this group understands what it takes to finish off games. 3 points earned in 1 game played in the Big Ten. We’ll take it. Even more so we like the upside. Zakyi may not be ready for the Indiana match, and Atuahene may not be 100%, but how dangerous is this club with all of their guys. We won’t blow it up just yet, but this group can play. Written by: Billyle Alman It may not be confirmed, but we are going to assume Francis Atuahene is ready to take the next step in joining his teammates in the starting XI this Friday. Ivo Cerda had a great opening performance in Monday’s outing as a forward, but we believe a healthy Francis will slide Ivo back into the central midfield. Michigan enters this Big Ten Opener with an overall record of 3-0-1. As early as it is, the stats are impressive for this group when comparing to the 2016 season. With 6 goals for and only 2 against, the Wolverines have been able to secure 2 clean sheets in 4 contests. Questions heading into the season revolved around the uncertainty at center back and goalkeeper. An undefeated start through 4 games leads us to believe that this coaching staff feels comfortable with the individuals they have in those spots. With those defensive areas covered, the most impressive stat comes in the form of goals. This group has not been shut out yet. Without some of their most explosive playmakers, they have been able to score at least 1 goal in each match this year. As newcomers like Osman, and hopefully Zakyi, continue to grow in Michigan's style of play, we believe goals will continue to come for this club. Through three games, the Badgers visit Ann Arbor with a record of 1-0-2. Wisconsin earned their first win of the season in the clubs most recent home match against Grand Canyon U. Though Wisconsin returns some experienced players, they have allowed 4 goals in 3 games, three of which coming in road contests. Wisconsin’s 3 players to watch all enter 2017 as seniors for the Badger program. Midfielder, Mike Catalano and Goalkeeper, Phillipp Schilling are preseason All Big-Ten honorees. The serious threat comes in the form of Hermann Trophy Watch List Forward, Chris Mueller. Mueller totaled 27 points for his side last year and is perhaps the Big Ten’s most proven offensive threat. This senior’s experience combined with the rest of this talented Wisconsin side means they are capable of scoring goals at home or away. The optimism for the Wolverines can be found in Wisconsin’s most recent defensive form. Wisconsin may have the ability to visit Ann Arbor and hold a clean sheet, but there are goals to be had for Michigan. Even with a All Big-Ten Goalkeeper in Schilling, there are holes in this Badger defense. We are excited to see how Michigan comes out in the early minutes on Friday. A loss to Wisconsin in the Big Ten opener would not be the end of the world for Michigan, but the schedule doesn’t get any easier from here on out. Michigan’s recent form leads us to believe they will come out early looking for all 3. Michigan visits a national contender in Indiana next week, this is a great opportunity to grab some early Big Ten points before things get really difficult. Player to watch for Michigan is Andrew Verdi. This goalkeeper will likely face more shots than ever before. Verdi has all the talent in the world, but is he ready to join the Big Ten’s elite? Tickets to Friday’s 7pm home match vs Wisconsin can be found here. The Michigan Wolverines hosted Dartmouth Monday for a Labor Day contest right here in Ann Arbor. As this side has been patiently awaiting the return of Francis Atuahene and Mohammed Zakyi, they were happy to welcome back Ivo Cerda into the starting XI. Cerda jumped right into his 2017 debut as a target forward (#9). The Wolverines have been without major production at that spot since Zakyi went down in game one, and Coach Daley opted to use a experienced player at that spot, though it may not be his natural position. Today’s matchup was the first time a visiting side chose to apply pressure early on. Dartmouth pressed high from the jump and possession seemed to be even through the first seven minutes. The challenge for the wolverines was to contain Dartmouth Forward, Eduvie Iboka who stood a good 6 foot 4 inches. In the 8th minute after a positive Wolverine build out, Umar Farouk Osman was taken down in the box earning a penalty kick for the Maize and Blue. It was Ivo Cerda who stepped up to the spot for Michigan but his PK attempt was taken low with minimal pace resulting in a comfortable save for the Dartmouth keeper who guesses correctly diving right. The pace of the game slowed down from there as the teams traded a much slower pace of possession for the next ten to fifteen minutes. The 32nd minute was an exciting one for Michigan as Francis Atuahene made his 2017 debut as a reserve entering the game for Ivo Cerda. Atuahene’s activity level was high though he didn’t see the ball enough. Michigan closed out the half with a majority of the ball, but the sides entered the break level at 0-0. Michigan entered the second half the way they started as Ivo Cerda started in place of Atuahene at forward. The Wolverines looked to be on the attack from the start in the second half. Osman flipped a switch and gave Dartmouth issues right away. Francis re-entered the game in the 61st minute replacing Osman, trying a stint out on the left wing. As he was of course dangerous at times, he seemed to be pressing in search of success. As he was understandably rusty, he took some premature shots and dished some passes that were played too late. Osman quickly re-entered the game for Cerda and pushed Francis back into his normal #9 role. As the game settled, Michigan was able to find the feet of Hallahan often down the right flank. It was Jack who saw the best chances in the second half as he was able to cut back onto his left and fire some shots on goal. Dartmouth did well to weather those chances and keep the game level. Rusty touches and all, the difference came in the 82nd minute when playmaker Francis Atuahene took a clever touch from a Hallahan pass. Francis tucked the ball around his left foot, then was able to fire a shot low with his left foot out of reach from the goalkeeper giving the Wolverines the 1-0 lead late in the second half. Dartmouth threw numbers forward in the closing minutes, but Michigan was able to stay steady defensively and hang on to the clean sheet. Michigan improved to 3-0-1 on the season. Another quality win for the Maize and Blue. Was it ever so good to have Francis Atuahene back. Though Michigan turned up the pressure in the second half, the game was level heading into the final minutes. With a potential overtime looming, it was Francis who made the necessary play to put this group over the top. Just minutes after scoring the game winning goal, he was subbed off due to fitness, but as everyone in the Big Ten Conference knows, this is a scary team with a healthy Francis. The return of Ivo Cerda has to be mentioned as well. His touches have been missed. He brings a certain calmness to this side that was lacking in previous games. We were happy with his play up top, but we will be delighted to see him return to the midfield. We are continuously impressed by the play of Ybarra. The freshman seems to be locked in as the sitting #6 for this squad. A healthy Cerda could bump Tristan Jacob out of the midfield, but through 4 games this group has been the benefactor of 4 solid performances from Jacob. The backline of Borges, Mukuna, Stevens and Samake earned another shutout today and looked poised to have many more in the future. Their solid effort combined with 3 saves from Verdi has to have this Michigan coaching staff feeling optimistic heading into Friday’s match vs Wisconsin. Through four games this season, the most valuable player for the Wolverines has been Marcello Borges, in our opinion. He solves problems, creates chances and just brings a professional understanding of the game to this lineup. His skill combined with Billy Stevens' leadership, and the size and ability of the Michigan center backs, will keep this team in each match they play this year. Find tickets to Friday's home big ten match vs Wisconsin here.